Lionel Girls Train Set: The Little Enginette That Couldn't | Skinner Inc. Collecting and playing with model trains has been a popular past time for over one hundred years. At the forefront of this train-crazed mania was Lionel Trains. 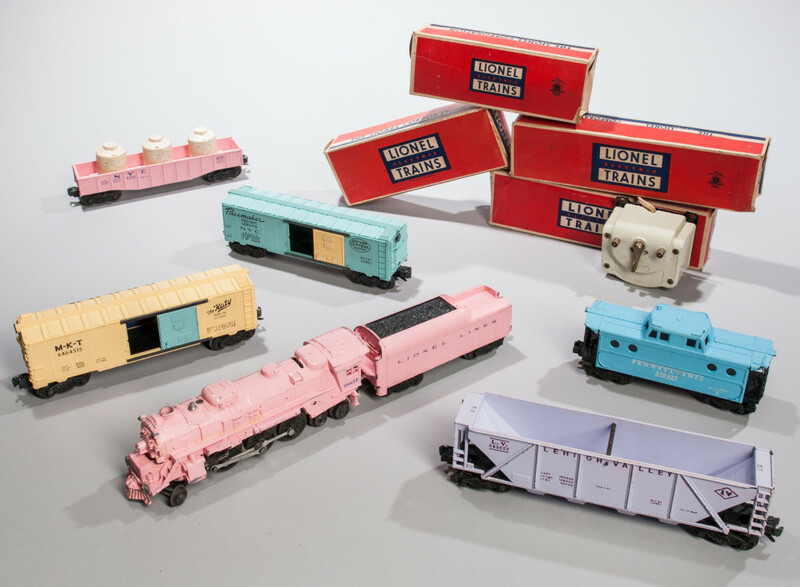 These sturdily constructed toy trains were praised and collected for their life-like realism by adults and children alike. Originally marketed towards fathers and sons to promote bonding, electric trains started to emerge as a male-centric hobby. Mothers and daughters might be visible in their advertisements, but more as someone who could passively view the trains in motion instead of engineering them. During the 1950s, Lionel saw a decline in popularity. Children were more interested in the glitzy appeal of space travel than in the locomotives of the first half of the 20th-century. Lionel decided that they needed to broaden their marketing base to include girls. With the notion that if they made the trains a little more whimsical and aesthetically appealing, girls would rush and demand them. Enter the Lionel Girls’ Train Set of 1957. The pastel-colored cars and locomotives certainly make a statement with a bubblegum pink engine leading the pack. Changing the color of the train set did not help the company. The girls who had been interested in trains in the past wanted the same ones that their brothers and fathers had. They wanted to pretend that they were engineering a realistic train. Children who wanted to play trains were going to play with ones that resembled ones at the real train yard. Trying to single girls out by painting the trains pink ended up backfiring on Lionel. Not many of the Girls Train Sets sold, and Lionel even had to buy a lot of their stock of pastel trains back, so that they could re-paint them and make some money out of this venture. Since they were such a flop, the Girls Train Sets are quite desirable amongst collectors today. Both women and men who might not have been interested in these oddities in the ‘50s now seek them out. Skinner is excited to offer one such train set in our current Discovery – Interiors online auction as Lot 1617. Bidding is open now and will begin to close Friday, February 17, at 2 PM ET. This entry was posted in Blog and tagged collectibles, Discovery auctions, Lionel, Lionel Girls Train Set, Lionel train set, Lionel Trains, online auction, skinner, skinner auctions, toy trains, train set, vintage toys, vintage trains by Carly Babione. Bookmark the permalink. I actually reproduced this set in N scale. Took about 3 months to get it right. We run it around the tree every Christmas. Really cute in N scale.